Do you love eating pasta, but you don’t think that it can fit into a healthy and wholesome diet? Then you’re really going to eat up today’s show as Alexandra Caspero, RD and I dig into pasta with a modern, Italian twist. 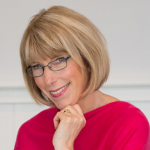 On the show, this fellow dietitian and cookbook author and I share some easy and nutritious recipes that I’m sure you’re going to want to make for your family. Listen in to find out why you really can eat pasta! Today’s guest, Alex, is a vegetarian, who is based in St Louis. She is a registered dietitian, and she’s the voice behind the beautiful food blog, Delish Knowledge. She’s also the author of the new cookbook, Fresh Italian Cooking for the New Generation. 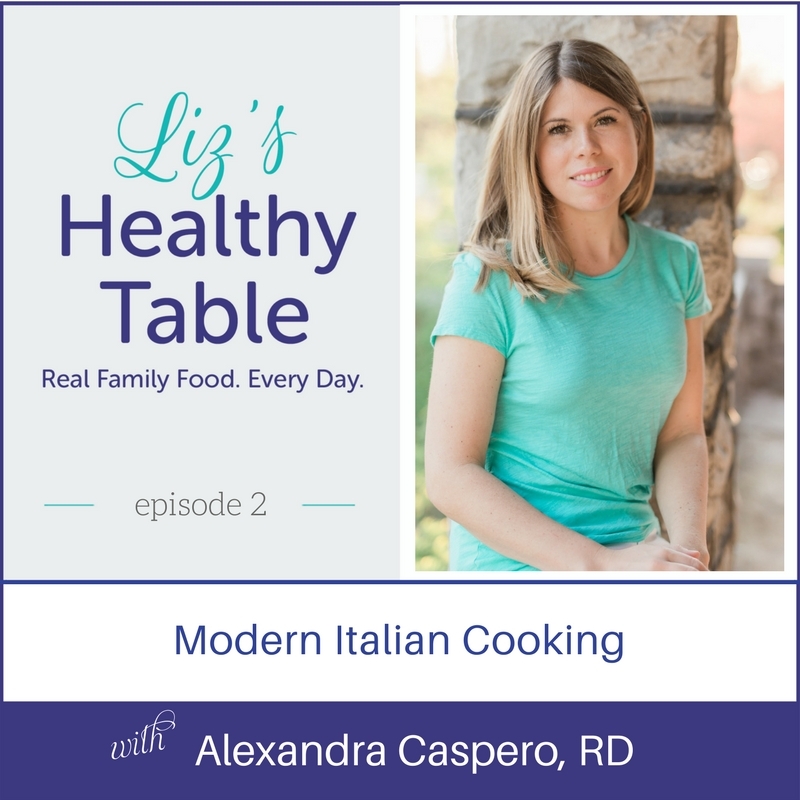 Listen in to today’s show and discover more about healthy eating, the Italian way. 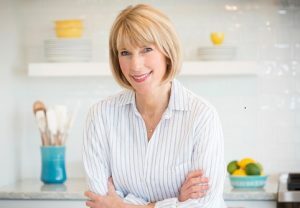 Alex is giving away a signed copy of her cookbook (U.S. only). Head to my blog and leave a comment on my Pasta e Fagioli recipe and giveaway post. Two of the recipes from Alex’s book – Roasted Vegetable Ziti and Pasta E Fagioli. 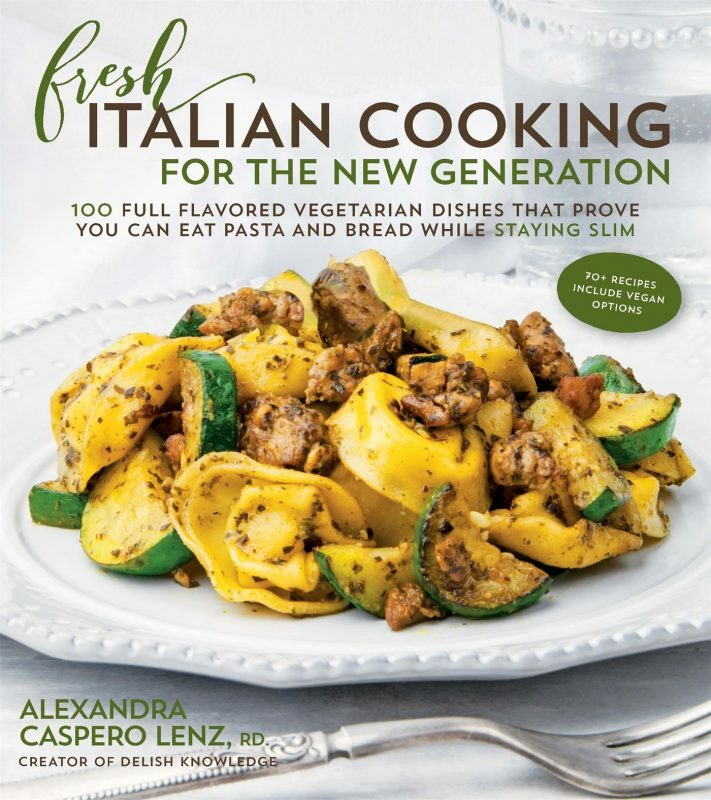 Alex’s book- Fresh Italian Cooking for the New Generation. Making meat-free meals really enjoyable. Alex’s meat-free, delicious Mushroom Lasagna. 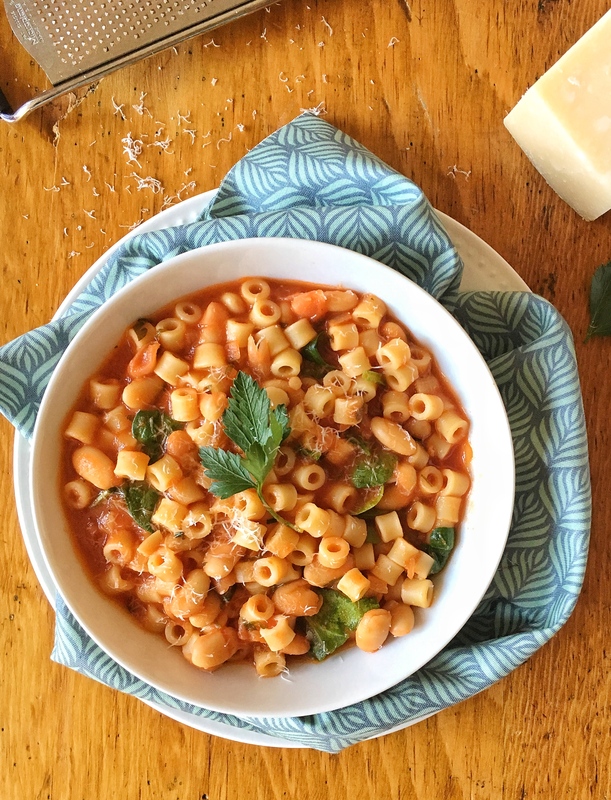 The story behind Alex’s recipe for her Grandmother’s recipe for Pasta E Fagioli. Why kids will really enjoy Alex’s Pasta E Fagioli. The magical properties of pasta water. Herbs – they can really take a dish from ho-hum to delish! That Italian cooking is meant to be designed as you go, so improvise till your heart’s content. The difference between whole-wheat pasta and white flour pasta and substituting gluten free pasta if necessary. Making your own pasta- great to get your kids involved! Alex’s favorite recipe in her book – Fresh Corn and Zucchini Gnocchi. The different choices that are available for you in Alex’s cookbook. Alex’s favorite foodie- Ina Garten of the Food Network. The cookbooks that Alex thinks everybody should have on their bookshelf. Pasta e Fagioli from Fresh Italian Cooking for the New Generation. For “restaurant worthy pasta,” cook dry pasta until it’s less than al dente, then finish cooking in the sauce along with a healthy dose of pasta water. So, if the package calls for 10 minutes until al dente, I’ll cook it for 5-6 minutes, then add the pasta to the warmed sauce on the stove with a ladle or two of pasta water. Keep tossing the pasta in the sauce, allowing the noodles to absorb both the sauce and the pasta water. Keep adding more pasta water as needed, until the noodles are perfectly al dente. If I really want to make the pasta yummy, I’ll add in a smidge of ground parmesan cheese (not grated, it clumps too much) and a little butter. The cheese and butter melt into the pasta, adding flavor and a beautiful glossy texture. Preheat oven to 375 F. Toss the squash, carrots and broccoli with the olive oil and a pinch each of salt and pepper. Mix well and place in a single layer on a baking sheet (you may need two sheets.) Roast for 35-40 minutes until just tender. 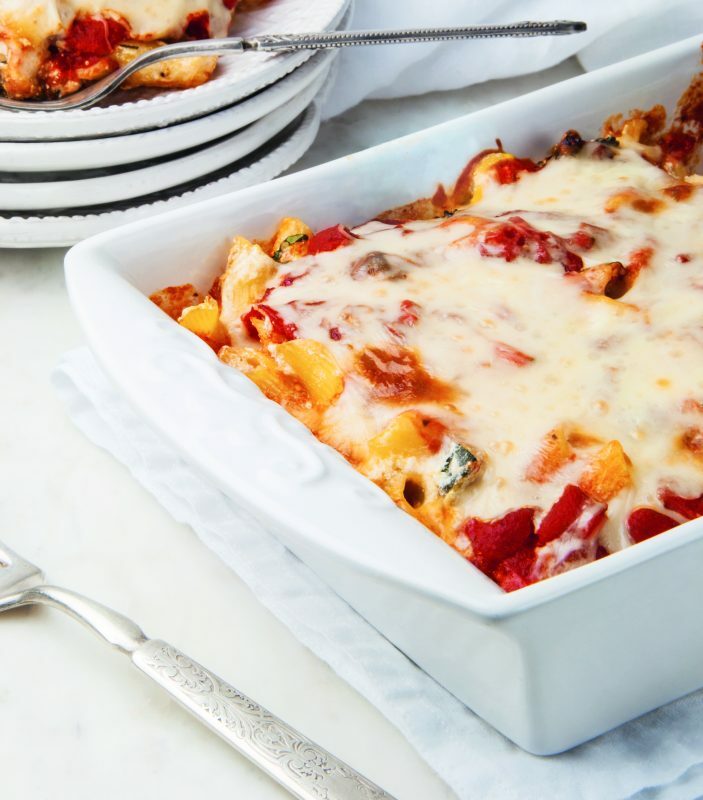 While the vegetables are cooking, make the ziti. Bring a large pot of salted water to a boil and add the ziti. Cook until just al dente, then drain but do not rinse. In a large bowl, mix together the ricotta, cheese, egg, ½ cup mozzarella cheese, nutmeg, crushed red pepper flakes, and a few cracks of freshly ground pepper. Add the vegetables and pasta to the cheese mixture and stir until just combined. Reduce oven to 350 F. Pour 1 cup of the marinara sauce in a 9X13-inch baking dish, enough to cover the bottom. Add the ziti mixture and cover with remaining sauce. Top with ¾ cup mozzarella. Lightly tent with foil sot hat the cheese doesn't stick to the foil, and bake for 30 minutes. Remove the foil and cook another 15 minutes until bubbly and hot. Remove from oven and let stand 15 minutes before serving. NOTE: For easy cleanup, place all of the prepped vegetables in a large mixing bowl. Then, use the same bowl to mix the cooked vegetables in with the pasta and cheese. I’m able to bring this podcast to all of you thanks to my sponsors: Zespri Kiwifruit and Bush’s Beans. Thanks!! Have a question about the show or a suggestion for a future show? Ask away! And don’t forget to enter the giveaway over at the blog. Thank you for the podcast. I think a lot of people are moving away from pasta and grains is because a lot of people, myself included, are becoming pre-diabetic which is a disease of starchy carbohydrate intolerance. Part of this disease is that starches, like pasta, will cause rapid wieght gain, particularly around the middle. I think that is why people are blaming grains for weight gain. Although I think that if you have normal carbohydrate tolerance that pasta/grains will not affect you that way. I have tried to eat whole grains, but my blood sugar levels get too high and I don’t feel well. I also feel best when I eat small amounts of animal protein, but I try to source from animals that are treated well and fed properly. Please don’t assume that turning away from grains is just a fad. Pasta is the grain based food I miss the most! But thank you for the recipe. I am always trying to add more vegetables into our diet. This looks like a great one to incorporate my leftover veggies in the fridge. I will probably use a whole food pasta substitute like pasta zero, or just leave out the pasta part.